It is 1784, and Ann Hamilton and her family have left Gettysburg and moved west, over the Allegheny Mountains to the Western Country, where they must do without many of the modern comforts they enjoyed back East. In her diary, Ann laments the loss of everything she loved about her past life, including being able to spend time with her cousin Margaret, and not having to put up with pesky Andy MacPhale, the squatter's son, who seems to enjoy taunting her. When a surprise visitor turns up on Ann's doorstep one day, however, her whole outlook on the West changes, and she realizes she and her family are at the forefront of an important American movement. Author Jean Fritz based this book on an actual entry in her great-great-grandmother's diary, a fact which is sure to please young readers who always want to know if events described in books really happened or not. Though many of the details surrounding Ann's life are invented, she comes across as a very real ten-year-old, torn between her love for her old home, and her desire to please her family as they embrace their new life in the wilderness. Young readers will easily relate to her longing to do normal things, such as have a tea party, and her fears about surviving the long, cold winter. Despite how long ago Ann is living, kids will feel as though they know her and could be her friend. 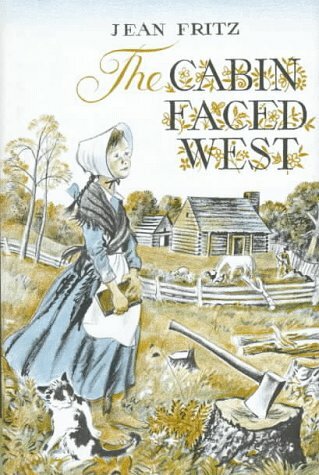 Like The Courage of Sarah Noble, The Cabin Faced West is a chapter book most suitable for newly independent readers. The font is large, and the vocabulary is fairly basic, with very few completely unfamiliar words. This makes it a perfect choice for introducing pioneer living to kids in the early elementary grades, and maybe even to younger kids, if the book is read aloud. Because of (spoiler alert) George Washington's visit at the end of the story, it also works as a tie-in for a Presidents Day lesson.